Beverly Hills is surrounded by the cities of Los Angeles and West Hollywood. 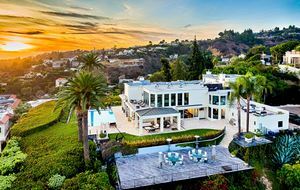 In spite of the city's name, most residents live in the "flats" of Beverly Hills, which is a relatively flat land that slants towards the hills, and includes all of Beverly Hills itself. The houses situated in the hillside north of Sunset Boulevard have a much higher value than the average housing price for the rest of the city.